United Kingdom, Republic of Ireland, 19th August 2010 ? Canon today (19 Aug) unveils the latest model in its successful PowerShot S-series with the launch of the new PowerShot S95 ? an advanced, compact digital camera for photographers looking for outstanding low light performance and manual control in a pocket-sized body. Succeeding the highly-acclaimed PowerShot S90, the new model offers improved handling, greater levels of manual control, HD movie capabilities, the HS System and Hybrid IS ? providing a powerful feature set capable of superb image quality in all shooting conditions. Building on the S-series? core principle of offering advanced manual control and low light performance in a compact body, the new PowerShot S95 takes the range to new heights, with features designed for users who demand maximum control and premium image quality in all conditions. The popular lens Control Ring, introduced with the PowerShot S90, has been improved with greater levels of flexibility, while a bright, f/2.0 lens and Canon?s HS System provide an even more powerful basis for low light and creative photography. The PowerShot S95 is also the first-ever Canon compact to feature Hybrid IS technology, providing improved image stabilization for macro photography. Improving on both the size and handling of its predecessor, the PowerShot S95 features an even slimmer body at just 29.5 mm thick CIPA Compliant, an improved multi-control dial and the same external coating used on the EOS 7D to improve slip-resistance and grip. Also designed to fit seamlessly into a photographer?s existing workflow, the camera offers RAW format shooting and support for Canon?s Digital Photo Professional (DPP) software. The PowerShot S95 includes Canon?s HS System ? a combination of a high-sensitivity 10.0 Megapixel CCD sensor and powerful DIGIC 4 processing, which provides exceptional low light performance; even better than that of its predecessor. The HS System enables the camera to support a maximum ISO of 3200 at full resolution and works to reduce the occurrence of noise at all ISO speeds for high quality images. Users can also set their own parameters in Auto ISO mode, with the ability to limit the maximum ISO speed they want to employ during shooting. Using Low Light mode, the camera can also achieve an extended ISO range from ISO 320 to ISO 12800, capturing images at 2.5MP resolution. Manual control of ISO settings and white balance in Low Light mode also provide greater control over shots taken in darker conditions, allowing users to accurately capture the ambience of a dimly-lit environment exactly as they see it. Low Light mode also enables higher speed shooting, capturing up to 3.9 shots per second so a moment is never missed. As well as providing the ability to shoot without the flash and still achieve correctly-exposed shots, the PowerShot S95?s high-sensitivity sensor offers a greater dynamic range compared to conventional sensor types. Tonal range representation is improved as a result, allowing natural looking pictures to be captured in all conditions. A bright, f/2.0 genuine Canon lens perfectly complements the HS System, allowing more light into the camera and providing greater ability to use faster shutter speeds and freeze the motion of moving subjects. The PowerShot S95?s 28mm wide-angle lens features 3.8x optical zoom, allowing users to get closer to distant subjects during shooting. The camera benefits from Canon?s extensive heritage in lens design, having been developed using the same processes and high-quality standards employed to manufacture Canon?s EF lenses, ensuring sharp, high resolution images with every shot. Canon?s acclaimed optical Image Stabilizer (IS) counteracts camera shake ? reducing blur and enabling users to capture shots in darker conditions and shoot at a shutter speed approximately 4-stops slower than would otherwise be necessary to achieve a blur-free shot. Hybrid IS also prevents image blur during close-up shooting, counteracting angular and shift shake that becomes more pronounced during macro photography. The PowerShot S95?s unique and enhanced lens Control Ring enables the adjustment of various shooting settings such as ISO (in 1/3 stop increments), shutter speed, aperture, focus and exposure compensation ? providing a satisfying and tactile experience. Offering even higher levels of customisation, the PowerShot S95 features a custom setting that allows the user to pre-set the function of both the lens Control Ring and the rear Multi-Control Dial in various shooting modes. A dedicated shortcut button can also be configured to provide instant access to pre-selected functions, offering the photographer easy access to settings during shooting. To track subjects that are in motion, or to help achieve a creative composition, a new Tracking AF mode offers the ability to select objects from the centre of the frame and track them if they move, or if the frame is recomposed. The handling of the Multi-Control Dial has also been redesigned following feedback from owners of the preceding model. The dial now features a more pronounced ?click? mechanism, preventing any unintentional changes to settings. Furthermore, the positioning of the ?Ring Func.? and ?On/Off? buttons has been revised, providing greater all-round operation in everyday use. A 7.5 cm (3.0?) 461k-dot PureColor II G LCD screen features a tempered glass outer layer, offering enhanced strength, high contrast and a wide viewing angle that offers greater visibility even when shooting in bright conditions. A new RGB histogram available in playback also allows photographers to instantly check the exposure of a shot in detail. The PowerShot S95 features 720p HD 24fps movie recording with stereo sound. The inclusion of Miniature Effect in movies also adds a completely new dimension to video footage ? shooting at a slower frame rate for dramatic and compelling time-lapse-style videos which appear of model scale. An integrated HDMI port with CEC compatibility makes it simple for video and stills to be viewed and controlled directly using a compatible HDTV and remote control. A High Dynamic Range shooting mode allows the capture of high contrast scenes closer to how they appear to the human eye. Exceeding the limitations of conventional cameras, the PowerShot S95 takes three different exposures of the same scene Tripod required for High Dynamic Range shooting before analysing and combining shots to create a single image in-camera. The result is an image that captures highlight and shadow detail closer to how the photographer sees it. The PowerShot S95 includes a range of shooting modes to match the desired level of control or the photographer?s skill. In addition to the flexibility of Full Manual control and semi-automatic Aperture priority (Av), Shutter priority (Tv) and Programme AE modes, the PowerShot S95 also features Smart Auto for those who simply want to capture great shots instantly. Scene Detection Technology within Smart Auto helps to provide the best results in all conditions, intelligently detecting the scene and selecting the optimum settings from 28 variables. Hints & Tips messages within the UI also make everyday operation as simple as possible, intelligently guiding users through the camera?s menu and offering a short explanation of each feature before it is selected. Smart Flash Exposure controls flash levels according to shooting conditions, providing the right amount of flash to ensure perfectly exposed shots in all situations, from darker rooms to bright sunlight. The PowerShot S95 also offers Multi-Aspect shooting, with 3:2, 4:3, 1:1, 16:9 and 4:5 formats supported. Allowing photographers to shoot according to their subject or the intended use of the image, Multi-Aspect shooting provides the ability to choose which composition and result they want to capture as the image is taken, without the need for post-processing. Easy, wireless content transfers are supported by Eye-Fi connected functions, allowing remote uploads to image sharing websites such as CANON iMAGE GATEWAY. The camera features a dedicated Eye-Fi section within the User Interface, and disables the auto power-down function when the Eye-Fi card transmits data ? allowing the easy transfer of content without interruption This product is not guaranteed to support Eye-Fi card functions (including wireless transfer). In case of an issue with an Eye-Fi card, please check with the card manufacturer. Providing excellent all-round image quality and excelling in low light, the PowerShot S95 offers an extensive feature set designed to deliver outstanding performance. Built for those who want the perfect combination of portability, power and control, it?s the ultimate pocket-camera for the even the most advanced photographer. 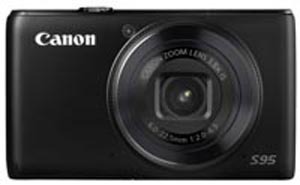 Owners of the PowerShot S95 can join the CANON iMAGE GATEWAY, an online facility for sharing photos and video. Photographers can take advantage of up to 2GB of personal storage capacity, creating enough room for hundreds of high-quality images. Mobile browsing is also supported, making it easy for friends and family to view photos on the move. The PowerShot S95 is available from August 2010, priced at £399.00/?479.00 RRP inc. VAT.